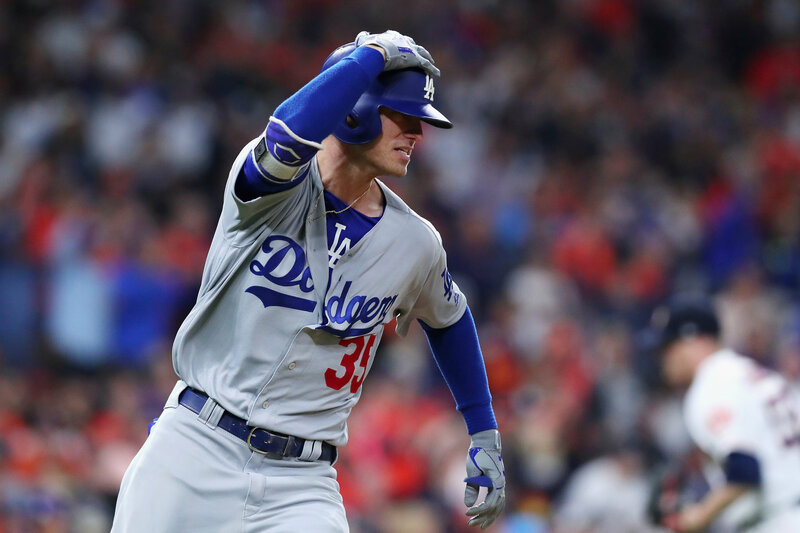 HOUSTON — It took until the World Series, but Los Angeles Dodgers first baseman Cody Bellinger had finally begun to resemble a rookie. He had gone from looking precocious at the plate to besieged, a 22-year-old who was suddenly hitting like one. Still, despite Bellinger's strikeouts and fruitless at-bats, Manager Dave Roberts saw him keep smiling, so Bellinger remained anchored in the cleanup spot. That patience was rewarded in Game 4 of the Series on Saturday night as Bellinger delivered two late doubles — one that helped the Dodgers draw even and one that put them ahead — as they rallied for a 6-2 victory over the Houston Astros, evening the Series at two games apiece. The Astros, who will send Dallas Keuchel against the Dodgers ace Clayton Kershaw on Sunday night in Game 5, were undone by a shaky bullpen. As closer Ken Giles, who blew a two-run lead in Game 2, tried to protect a 1-1 tie, Bellinger doubled home Corey Seager with the go-ahead run in the ninth. 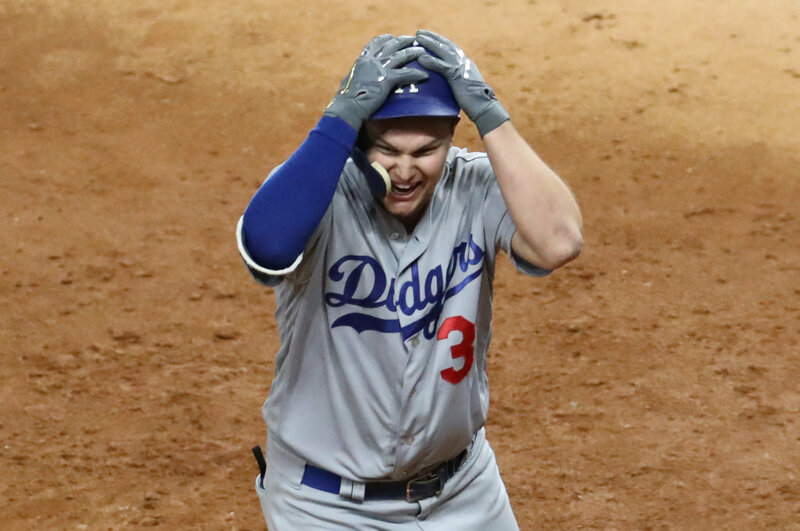 After a sacrifice fly by Austin Barnes off Joe Musgrave put the Dodgers ahead, 3-1, Joc Pederson ended any suspense with a three-run blast. The Astros managed only two hits all night — solo homers, by George Springer with two outs in the sixth and by Alex Bregman with two outs in the ninth. Bellinger, who had been 0 for 13 with eight strikeouts before he doubled and scored on Logan Forsythe's two-out single in the seventh to tie the score, helped decide an unlikely pitcher's duel between the team's No. 4 starters, Alex Wood of the Dodgers and Charlie Morton of the Astros. Wood carried a no-hitter into the sixth, when Springer broke up the scoreless duel with his homer. Morton was only slightly less flawless, facing the minimum number of batters through five innings. Thus far, each game has delivered an unexpected element. Game 1 came with extreme 103-degree heat. Game 2 brought a rare blown save by Dodgers closer Kenley Jansen and late, no-quit, home run-fueled comebacks by both teams. And Game 3 was marred by a racist gesture by the Astros first baseman Yuli Gurriel. Gurriel's act, in which he stretched the side of his eyes after hitting a home run off the Dodgers' Japanese pitcher Yu Darvish, provided the backdrop for Saturday night's game. Earlier in the day, Commissioner Rob Manfred suspended Gurriel for five games at the start of the 2018 season, but chose not to discipline him for the World Series, in part because he did not want to penalize the rest of the Astros. "I think that it gives us all some closure in the sense that it was something that happened," said Dodgers Manager Dave Roberts, whose mother is Japanese. "The way that it was dealt with, I support." 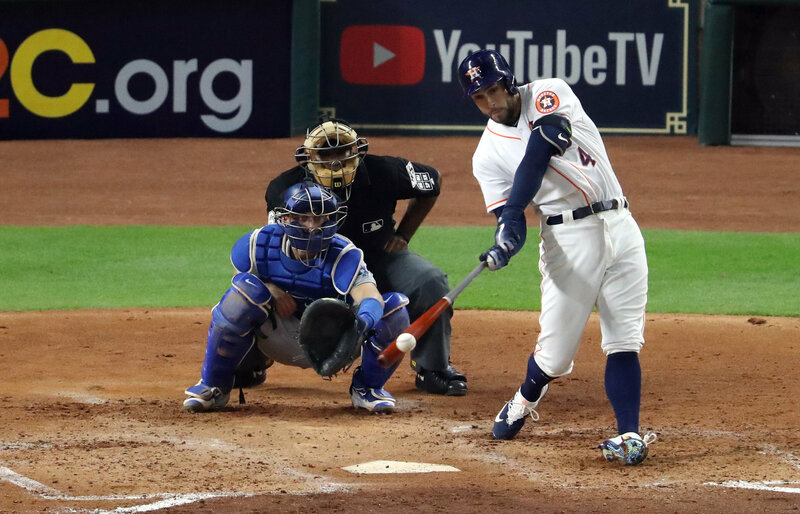 Gurriel, who received modest applause from Astros fans when he came to the plate for his first at-bat on Saturday, was not a factor as Game 4 proceeded. The pitching was. It was hard to anticipate this type of duel arising with Morton and Wood on the mound. Wood gave up three solo home runs in his only start in the postseason — the one game the Dodgers had lost on their way to the World Series, a 3-2 defeat against the Chicago Cubs in the National League Championship Series. Morton, in a career limited by injuries and inconsistency, had done little until this season to distinguish himself. "Basically, Charlie's been his own worst enemy in that he tries too hard to please," Astros pitching coach Brent Strom said at the start of the series. "But Charlie is a great competitor, he's great to be around. The other players love him. With him, it has always been great stuff, marginal control, can go off the rails at a time. But this year he's been nothing but fabulous." Strom, who described Morton as "a glass half-empty guy," wondered if Morton's performance in Game 7 of the American League Championship Series would be a springboard moment. Morton shut out the Yankees on two hits over five innings of a 4-0 win that sent the Astros to the World Series. The carry-over seemed to be there on Saturday. Morton allowed a leadoff single to Chris Taylor and not another base runner until he hit Austin Barnes with a pitch with one out in the sixth. 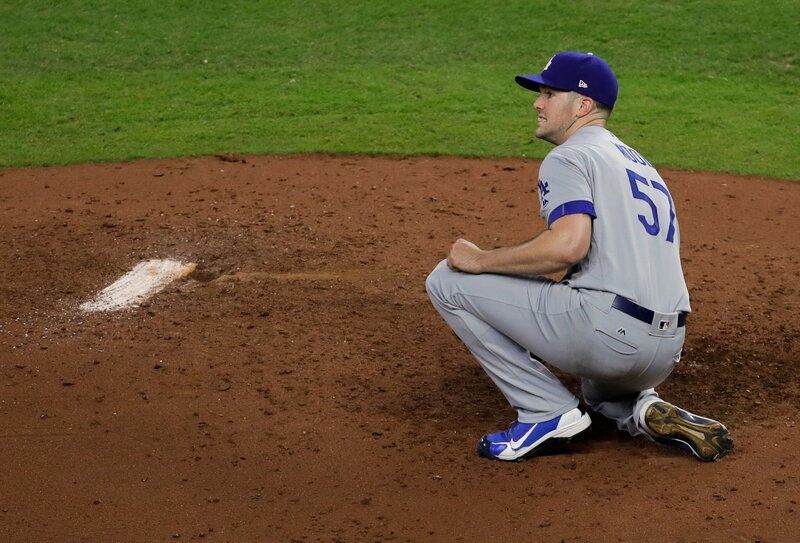 The Dodgers then mustered the game's first threat when Enrique Hernandez delivered a full-count, run-and-hit single to center that sent Barnes to third. But Astros third baseman Alex Bregman kept the game scoreless by throwing out Barnes at the plate on Taylor's chopper. It was almost identical to a pivotal play Bregman made in Game 7 of the A.L.C.S., when he gunned down the Yankees' Greg Bird on a much closer play to preserve a 1-0 lead in the fifth inning. Morton then retired Seager on a liner to left to emerge unscathed. The escape was a prelude to the Astros' taking the lead when Springer jumped on a two-out, 3-1 curveball from Wood and hit it high off the wall above Minute Maid Park's left-field bleachers. It was the last pitch for Wood, who was relieved by Brandon Morrow. Until then, Wood, a left-hander with the herky-jerky delivery, had been brilliant. He allowed only two runners, both on walks, and one of them — Carlos Correa – was erased when Wood got Gurriel to ground into a double play. Until Springer's home run, only three balls were hit to the outfield. The Dodgers got even in the seventh when Bellinger reached on a one-out double that eluded left fielder Marwin Gonzalez in the nook in left-center field. As Bellinger coasted into second, he raised his hands and gazed upward as if to give thanks for his first hit of the series. It was also enough to chase Morton. If the Astros' bullpen has at times been shaky in the playoffs, at least it was well rested for Game 4 — thanks to an off day on Thursday and the relief performance Friday night by Brad Peacock, who pitched the final three and two-thirds innings to save a 5-3 victory. So Manager A. J. Hinch, after a brief conversation with Morton on the mound, signaled to his relievers. Will Harris came on to retire Yasiel Puig on a deep fly to right field, but Forsythe followed by lining a 2-0 fastball for a single that easily scored Bellinger. It was the break the Dodgers were waiting for, and the breakthrough would soon follow.